The main new features of AKL FlowDesigner are improvement of the stability of calculation and the usability of modeling and mesh edit! Import feature of SketchUp and 3DS file format is now available! Improvement of repair object tool and shape recognition has reduced analysis work on complicated models. 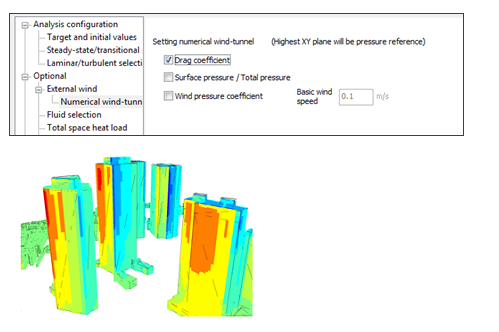 Also, numerical wind-tunnel feature and solar integration analysis (optional) have been added and that allows you various analyses. In addition to .stl format and .ifc format, .skp format which is exported from Google SketchUp and .3ds format which is exported from many kinds of CAD software are now importable to AKL FlowDesigner. That expands the possiblity of analysis using CAD data. It might happen that some parts of objects corrupt or are not suitable for analysis when importing data from CAD/3D modeling software to AKL FlowDesigner. “Repair object tool” is useful for such obejcts. Drag coefficient, Surface pressure/Total pressure, and Wind pressure coefficient are now available to output on the result, and that shows the effect of air flow on surface of buildings or objects. The analysis mode of solar integration has been added. It allows you to analyze the integration amount of solar radiation heat on each objects' surface for specific period of time. *”Solar/radiation SET*” option is needed for this analysis. Contact for the details. There are also more other features that help analysis and modeling.